So, I’m in Portugal, and have been for the past few days to celebrate John getting hitched. 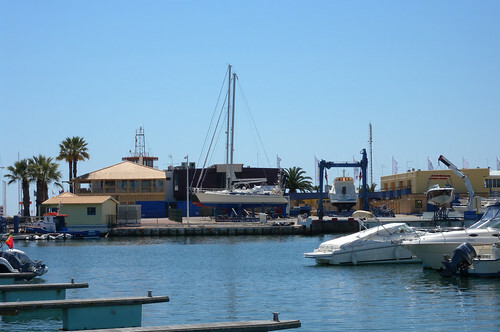 Vilamoura is the current location, then it’s on to destination Faro and Dublin tomorrow morning. They’ve got the sun. They’ve got the sea. They’ve got great food and cheap alcohol. But internet access leaves a lot to be desired. While I’m away, I rely on internet access. Dubai was easy as there was great access in the apartment and I was never far away. I was mad enough this trip to pay 50 euro for 50mb data access on my office mobile to pull headers via the Gmail app (S60). Two sessions on the laptop in the bar makes it a total of 70 euro, plus another tenner in the hotel brings it to 80 euro. For 80 euro, I happily get FOUR months of mobile broadband access at home. For 80 euro here I could also get in the region of 20 bottles of wine. And for all our going out, I know I haven’t spent 80 euro on alcohol. There an internet cafe / kiosk type place up the road from the hotel that’s very much chained up, broken down and left with wires hanging out of the walls. Yet while they’ve got everything else here, the one thing I’m not seeing is an internet cafe, of any description. Plenty of bars, plenty of TVs to watch Barcelona whip Man U around the place last night, but no internet cafe. The resort seems extremely popular with Irish and English tourists who I’m sure wouldn’t say no to getting online to check things out, or their kids hanging around Bebo and MySpace for the day (give them the option and they’d likely take it). The description of the hotel touted laptop connections in the room. I must have mistaken power points for ethernet points. That said, who am I to complain. It’s 33 degrees, possibly in the shade too and the wedding was the business. Maybe I’m one of those people who just can’t unplug. Anyone in the market for opening up a chain of cheap internet cafÃ©s in heavily populated Irish and English tourist resorts in the south of Portugal?